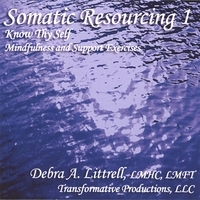 Somatic Resourcing CDs offer guided exercises to assist you in learning how to read truth for you. By being aware of what you are experiencing you can make more appropriate, authentic choices for you. Being self aware of how you communicate what is right for you, and being more present and aware, you can make choices that are best for you. These activities are also self soothing and can be used to take a break and decrease stress during your day. Somatic Resourcing 1 provides you support in your daily life to remember and stay connected to who you really are, to fully be present in your life, to take a break from the chaos in daily life and stay grounded in yourself. If you are just beginning, Mindfulness – Simple, allows you to focus on one aspect of your awareness at a time. Mindfulness – Integrative, allows you to begin tracking how physical sensations, emotions and thinking patterns are interacting. Support in a Chair can be helpful if you do not feel supported in your life and if you just enjoy taking a relaxing break in your day. Click here purchase the CD or MP3s through my distributor, CD Baby. To move through the tracks, click on the time indicator. If you click on the name of the track it will take you away from this page into a page with a player. 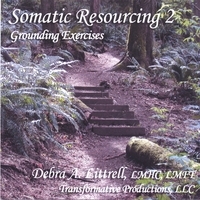 Somatic Resourcing 2 provides you with a guided tool for practicing your grounding exercises in your daily life. Somatic grounding exercises give you a “felt sense” of grounding, instead of using imagination or grounding energetically. This offers you an opportunity to explore what being grounded in your body feels like, and gives you an opportunity to compare what you experience when you are ungrounded. If you are just beginning, Sitting Grounding – Simple allows you to focus on basic changes. Sitting grounding – Integrative allows you to notice changes in sensations, emotions and thinking patterns, how your thinking effects your emotions and body, how your emotions may effect your thinking and body, and how your body can effect you thinking and emotions. Standing Grounding gives you more self awareness of your grounding when standing and in motion. Doing Mindfulness first and then Grounding exercises gives you an opportunity to get a baseline of what you are experiencing and then notice any changes in your physical, emotional, and cognitive signals after grounding. Your tracking skills allows you to receive full benefit from your grounding exercises. Debra A. Littrell, LMHC has training and experience in a variety of body centered, experiential forms of psychotherapy including The Hakomi Method and The Foundation Training of the Bodynamic Program.. She specializes in the treatment of both recent and historic trauma and developing resources somatically. She has been an EMDR™ practitioner since 1991 and, has been on staff with the EMDR Institute, Inc. as a Facilitator since 1996. She has practiced in a variety of settings since 1977. She is currently in private practice in Bellevue , Washington and works with adults and adolescents. She provides crisis intervention services for Emergency Service Personnel and has been a consultant for Auburn Police Department’s Peer Support Team. To find out more about Debra’s private practice including psychotherapy, Training and Consulting Click here.